A brilliant fireball was seen over Utah a few minutes past midnight last night. 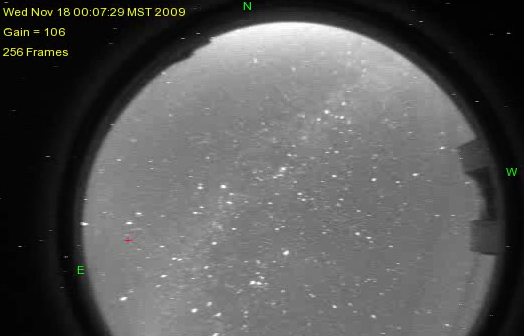 Video images give the time of the fireball as ~12:07 am MST (7:07 UT). At least 2 comments to this blog describe the event. KSL TV has a whole bunch of videos listed on their website. Especially check out Patrick Wiggins video where he gives a great and thorough explanation of what the fireball was. Some of the videos show the actual fireball in the sky while others show the ground being lit up as bright as day. Further news stories can be found at The Salt Lake Tribune and Spaceweather.com. Six or so hours later, as the sun was rising, a ghostly blue trail was observed over Utah. This trail appears similar to those seen after other bright fireballs. What is amazing is that trail had not dissipated after such a long time. Note, the crazy meandering pattern of the trail does not mean the fireball was moving erratically. The erratic pattern of the trail is due to varying wind speeds and directions in the upper atmosphere. So far I have not seen any images or videos of the fireball. All the videos and images just show the ground or sky lighting up. As Miah wrote above, the fireball lit up the ground as bright as day. Though it was probably below the horizon as seen from Tucson, the sky did brighten towards the north. My north facing meteor camera did detect a brightening of the northern sky. Though I recognized it as something unusual when I looked over the data this morning, I deleted the data since there was no obvious meteor in the field. Only later did I read about the Utah fireball. Luckily the MMT all-sky cam picked up the flash from Mount Hopkins, just south of Tucson. The flash was observed to the north at the exact time of the fireball so there is no doubt they are related. If the flash was seen as far south as Tucson, it is likely that it was also seen from a wide area including the states of UT, AZ, NM, CO, WY, ID, CA,NV, and OR. Though the fireball occurred at a time when the Leonids were at their best, it is doubtful it is related to the Leonids. The Leonids are extremely fast meteors, in fact they are almost as fast as meteors can get (~70 km/s). As a result, Leonids rarely last more than a second and usually burn out in one very quick burst. The fact that this fireball lasted for some time (~5 seconds) means it was a much slower meteor that probably descended to a low altitude (~20-50 km). It is more likely it was caused by a small (0.5 to 2 meter) asteroid. I saw the flash last night as I was driving north on Hwy 287 Near Loveland Colorado. It was greenish and very large over the nothern western sky. The time was about 11:10 MST. I dont know how long it was visible. I looked up and only saw it for about a second. I was heading south toward Ogden on 89. The sky got bright as day in a series of increments it seemed to me that lasted for a few seconds. I didn’t see the meteor because of the roof over me in the van. I was more looking for trees to bend in the distance because I thought a nuke had gone off :-). Glad it was the other. I was ready to head my van into it and park hoping not to get blown off the road. The guy who was waiting up for me though..he actually saw the fireball. I was driving home after taking my wife to dinner in Paso Robles, CA. We were heading east on Highway 46 and just to the north east we caught this round object falling from the sky and it looked like it was burning green. The flame was pretty visible and it wasn’t moving fast like a meteor, but just seemed to drift as it . was falling. Since it was dark it was hard to tell how far away it might have been or where it was going to impact. After about 8 seconds it dissappeared behind some distant hills and we saw a bright flash of light. I thoght maybe it had impacted in the San Joaquin Vally but later reports indicate that it may have been the Utah incident. WOW… That must of been one large meteor if I could see it from here.